An extremely loaded word these days. And because it's been the centre of some very heated debates, people forget that adoption is in fact an emotionally charged issue, for everyone involved. When Packrat and I were trying to have kids, we had to face the distinct possibility that we couldn't have any of our own. That started us talking about adopting. For some reason, I got it into my head that I wanted to adopt a child from Vietnam. Over the course of our discussion about adoption, it came to light that if we went through with it, there would be people in our immediate circles that would have frowned upon what we would have done. And even though we hadn't even begun the process at that point, I was indignant on behalf of the child that we could have potentially adopted. At the same time, it made us very aware of the obstacles we were to face if we went through with it. Packrat constantly tells me that I need to be more like Teflon. I need to let things roll off my back. But I haven't ever been able to and the more I thought about adoption, the more I wondered and got angry at the imaginary comments that would be either whispered or blatantly said to us. "Why are you adopting? Why don't you just try a little bit harder? Aren't you scared that the baby you adopt has some strange disease or worse, was the offspring of some axe murderers? " I realised that these weren't just voices in my head because the few people I did mention something to, about our considerations, their comments approximated the above. We never had to go through with adopting but those months when we pondered gave me a glimpse into what parents who adopt must go through. Granted most people would be thrilled and supportive but oh! the tongues that could and would wag, especially with the older generation. Packrat's response to all this was to shrug and to say that the only thing we could do, as teachers, was to make sure the next generation wouldn't react in the same way. 2 1/2 years ago, they adopted Christian when he was about 3 1/2 months old. Darren stunned Packrat one day by whipping out his phone and asking "Want to see my son?" with no preamble whatsoever. After Packrat picked his jaw off the ground and told me about it, we rushed over to visit and brought Muffin along. In fact, we brought a whole bunch of Muffin's clothes and toys for Christian because Darren and Mel were given about a week to prepare for bringing Christian home. Every one including Muffin was excited about the new baby. He kept trying to put toys on Baby Christian. Over the course of the last two years, Mel and I have had conversations about the various reactions she's experienced with Christian and some of them were unsurprisingly small-minded and mean. And that's where my admiration for Mel lies. Mel has dealt with the comments in a more constructive way than many others, myself included, would have done. While I am certain she has ranted and raved about people who have said mean things about her kid, like most of us do, she also went on to write The Adventures of Squirky to introduce the idea of adoption to children. I am sure part of it was to prepare herself and Darren for the time where they would have to talk to Christian about it. 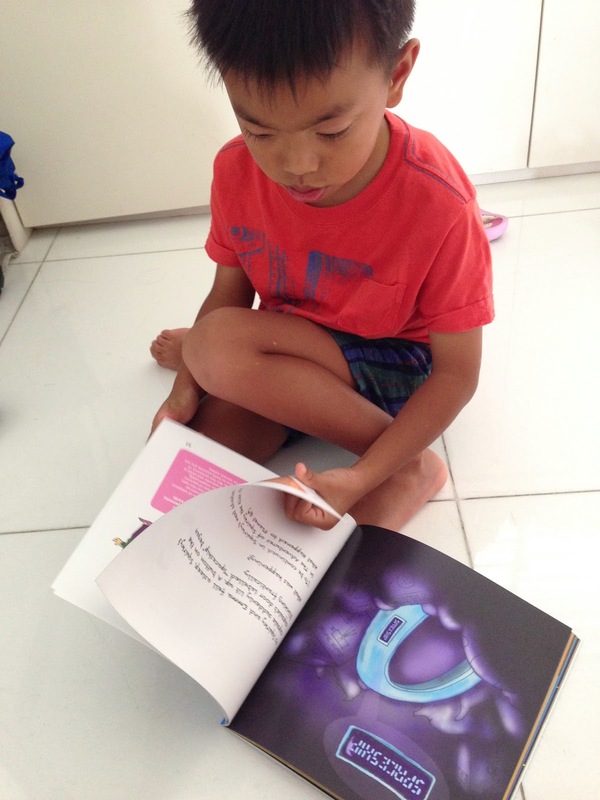 But at the same time, for her to write it meant that it was out there in Singapore, for many Singaporeans to pick up and read. And that is what will help to slowly change things. 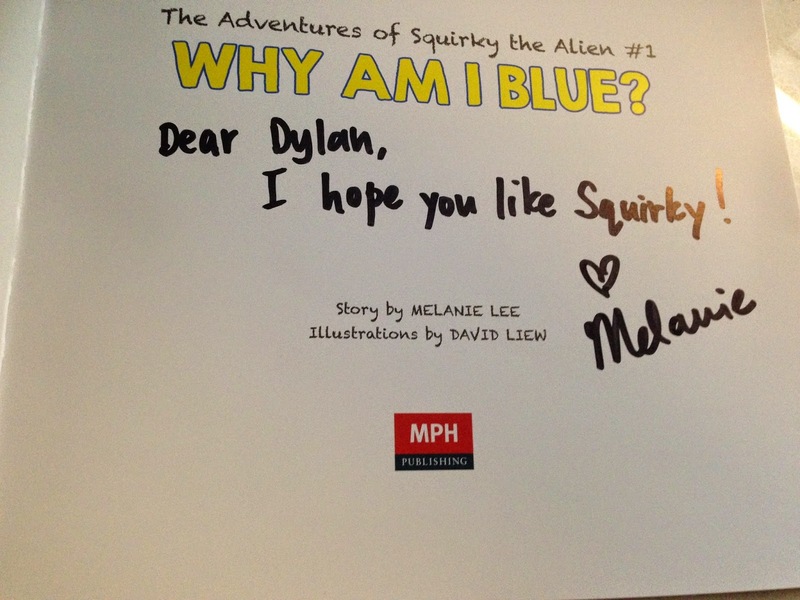 Mel sent us a signed copy of Why Am I Blue? for Muffin recently and JED descended upon it. We read the book together so that I could explain certain things to Muffin and the twins read it on their own. It's still sitting on our dining table and that, in our family, is high praise. It means the book is still being read and flipped through at meal times so often it is futile to keep it on the shelf. I asked JED what they thought about the book and the twins reply was that it was special. Muffin was still trying to understand why Squirky was blue. Anyway, there are many reasons why they thought the book was special. 1. The Mommy and Daddy are like us. (Meaning they are Asian). They don't have very many Asian based books so it was novel to see the characters in the book drawn like them. 3. There was no ending to the book (It is a series of 6 books). This last point is what makes the book truly great. 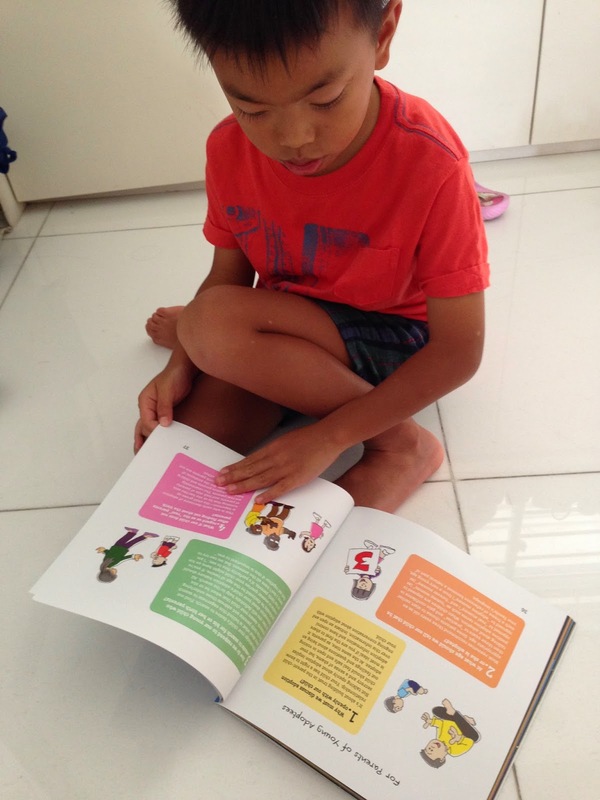 It is what makes it more than just a kid's picture book. 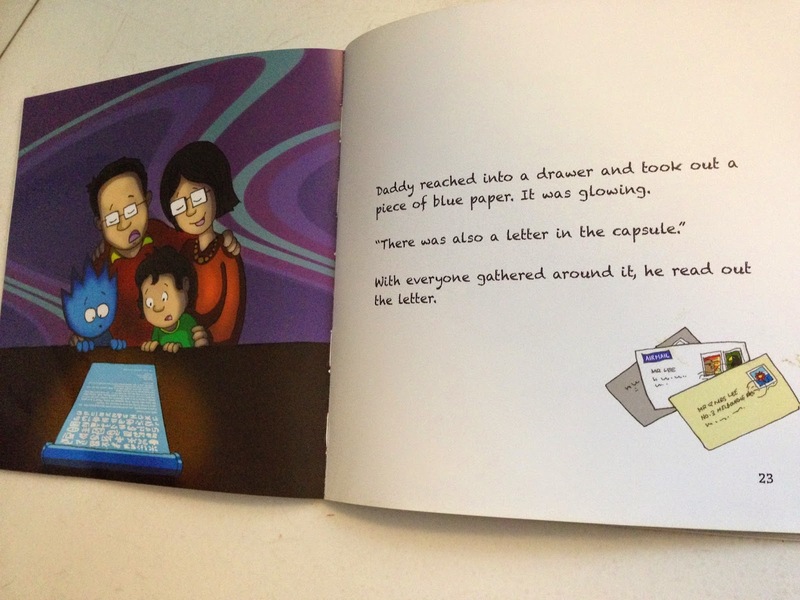 The questions do not just help parents who are unable to answer difficult questions. 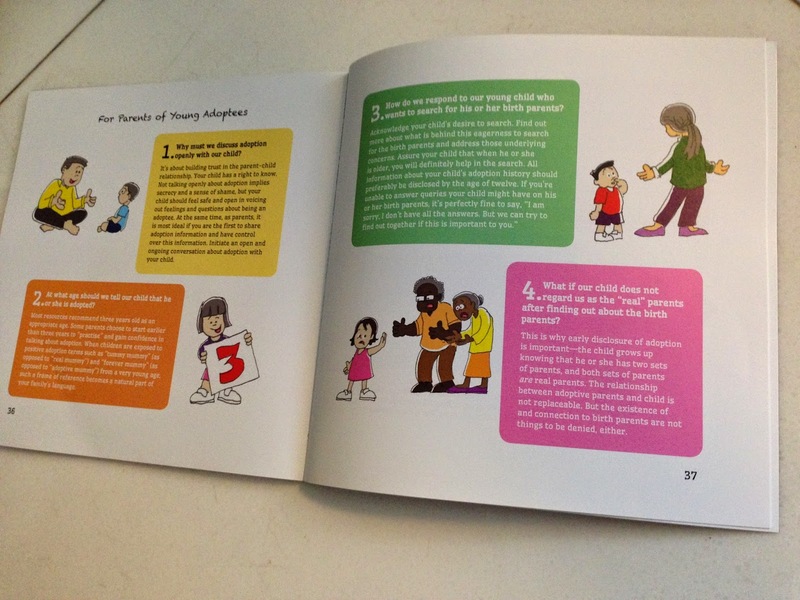 It also gives other parents an idea of what might go through the mind of an adopted child or any other child wrestling with the concept for the first time and how to talk about different types of families to their own children. Much of the resistance and taboo in society regarding this issue isn't going to go away even if we clubbed every single person over the head. (I have thought about that but there just aren't enough clubs out there). The way to actually do it is through little people like JED, who are still tiny enough that their prejudices haven't yet been formed. With stories like that, about people that look like them doing something so simply extraordinary, it becomes a slightly easier feat. For Packrat and myself, it was an opportunity to talk to the twins about how there are different ways families are set up; that the children don't really have to be born of the parents for parents to love them. Both were fascinated by the idea though they couldn't fully wrap their heads round the idea. I don't think we've fully made a dent in helping them understand the myriad of issues behind it but I do like that it gave us the opportunity to talk about some things that we don't generally talk about and at the end of it, they still wanted to go back to the book again. That in my book, is what makes a good book. 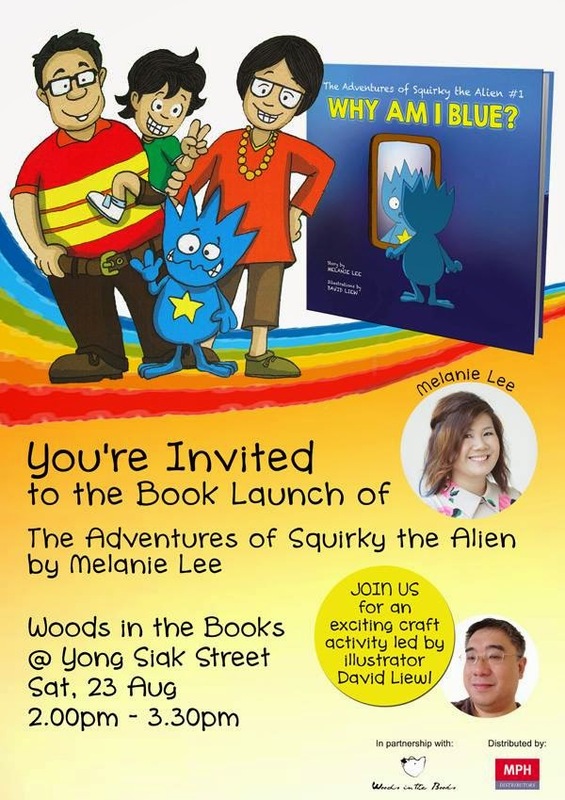 Squirky's adventures will be available to the public from 23 August onwards and everyone is welcome to its launch. It promises to be great fun. Melanie sent us a signed copy of the book as a gift. We reviewed it because we can never resist a good book and this is more than just a good book. So, there was no monetary compensation in any way and all views and opinions here are ours and JED's two cents worth.